DAVID IRVING, the historian, was accused yesterday of being a right-wing extremist who made statements deliberately designed to feed virulent anti-Semitism still prevalent in the world. During highly charged exchanges in the High Court, Richard Rampton, QC, accused Mr Irving of being a holocaust denier who based statements on the flimsiest evidence. Mr Irving is suing Deborah Lipstadt an American academic, and Penguin Books for claiming in her book Denying the Holocaust: the growing assault on truth and memory that he is a "Hitler partisan" who has twisted history. Wounded by Mr Rampton's allegation, Mr Irving, conducting his own case, accused him of playing to the press by making slurs. Ignoring Mr Irving's protest that the allegation was serious, Mr Rampton continued: "Our case against you is that you consort with deeply anti-Semitic people." Mr Irving, he said, had dignified himself as an historian who had lent his considerable weight to making statements denying that the Holocaust had taken place. "He has done so," he said, "because of his sympathies and attitudes. He is a right-wing extremist." PLANS to make denial of the Holocaust a criminal offence have been dropped by the Government less than a week before ministers are due to announce a British memorial day for victims of the Nazis. A Holocaust denial law was supported by Tony Blair before the general election. He said there was "a very strong case'' for such a measure. But Mike O'Brien, the Home Office minister, told MPs in a written Commons answer yesterday that legislation could not easily "strike a balance between outlawing such offensive statements while ensuring that freedom of speech is not unduly restricted". He added: "Therefore, while the Government are following carefully the current debates on this issue within the Jewish community and elsewhere, we have no immediate plan to introduce legislation." Holocaust denial is an offence in several European countries, including Germany, Austria and Lithuania. In Germany two months ago, a historian, Frederick Toben -- who claimed that Auschwitz prisoners enjoyed cinemas, a swimming pool and brothels -- was sentenced to 10 months in jail. Last year, Gary Lauck, an American, was released after serving three years of a four-year sentence for distributing anti-Holocaust material in Germany. 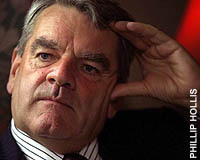 During his current High Court libel action, the historian David Irving has said that he was fined "a substantial amount" by German authorities in 1992 for breaking Holocaust denial laws. In Britain, legislation is based on the 1986 Public Order Act, which makes incitement to racial hatred an offence. But Jewish groups say that the law has proved ineffective and there have been very few prosecutions. While material denying the Holocaust may be offensive and untruthful, prosecutors say it is difficult to define incitement. Sweden next week. Jan 27 is the anniversary of the liberation of the Auschwitz-Birkenau concentration camp in 1945. It is already marked in Germany and Sweden and is established as the European Union genocide remembrance day. The Government says that it will provide a national mark of respect for all victims of Nazi persecution and represent a continuing commitment to oppose racism anti-semitism and genocide. Marie Woolf, Political Correspondent writes: The disbanded All Parliamentary War Crimes Group was yesterday reconvened for the first time in three years to press for the investigation of suspected Nazi war criminals in Britain. The emergency measure was taken after recent revelations about several cases, and Lord Janner, honorary secretary, said Britain risked becoming a "retirement home" for alleged war criminals who lived without fear of prosecution. The group agreed to ask Jack Straw, the Home Secretary, to call on the police to reopen several suspects' files and take steps to strip them of their British nationality.